I taught my second full night of classes at the Dark Side Studio last night. It was a really good experience, and definitely made me realize how far I've come since I was teaching in St. John's. I used to be intimidated by teaching, for a number of reasons, but it feels really different and amazing now. The sense of legitimacy and authority is coming and I don't feel very nervous in front of a group anymore. Instead of feeling like I was pretending to be the teacher (which, as a substitute, I functionally was) I just felt like I was Heather, teaching a class and doing a pretty ok job of it. One of the students, who always has something really insightful to say, came over before she left and said she thought it was cool that I was like a different person every time she saw me, and that I was going through a huge inside and out transformation. and felt significant enough that I made a note of it. I've been with my partner in life/crime Jay since 2004, and one thing that he has gently scolded me for over and over again almost the whole time is my consistent and not entirely joking use of the phrase "when I grow up". "When I grow up I want to be really good at x"
"When I grow up I'm going to be a y"
"When I grow up I'd like to have a z"
What he understood right away about the way I used those statements, and something I've only grasped recently, was that I wasn't using them in a "keep my inner child alive" kind of way (cause like, his inner child threatens to burst out of his body Alien-style on a semi-regular basis) but that it was a procrastination mechanism, it let me put things off because I wasn't "ready" yet. His response was always "you are grown up, you can do whatever you want". Not that I had to be boring or stop thinking big because I was an adult, but totally the opposite. As a grown up I have the authority to make sweeping changes to my life whenever I want, even based on child-like hopes and dreams. It was an important realization and I think about it a lot. Last thing. In reference to my last entry, the cat's out of the bag! I am performing at Charmed Infusion: An Evening of Non-Traditional Bellydance at the Basement Theatre of the Arts and Culture Centre in St. John's, Newfoundland. 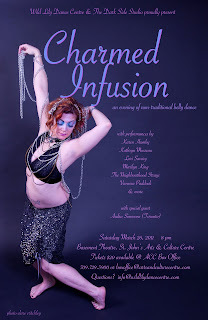 It's the first time I've performed in St. John's in well over a year and I'm looking forward to it immensely. Tickets are really limited, and if my family and friends are any indication, will be sold out quite soon. The piece I'm dancing there is one I've wanted to make for a couple of months now and I'm really excited to be showing it on my home turf. Also excited that it will be the first time that several members of my family will have seen me dance since I was about 12. Exciting!